The analysis of variance technique in Perform One-Way ANOVA takes a set of grouped data and determine whether the mean of a variable differs significantly among groups. Often there are multiple response variables, and you are interested in determining whether the entire set of means is different from one group to the next. There is a multivariate version of analysis of variance that can address the problem. The carsmall data set has measurements on a variety of car models from the years 1970, 1976, and 1982. Suppose you are interested in whether the characteristics of the cars have changed over time. Four of these variables (Acceleration, Displacement, Horsepower, and MPG) are continuous measurements on individual car models. The variable Model_Year indicates the year in which the car was made. You can create a grouped plot matrix of these variables using the gplotmatrix function. 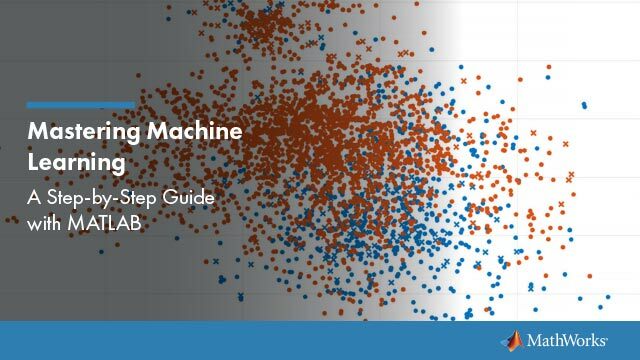 Create a grouped plot matrix of these variables using the gplotmatrix function. It appears the cars do differ from year to year. The upper right plot, for example, is a graph of MPG versus Weight. The 1982 cars appear to have higher mileage than the older cars, and they appear to weigh less on average. But as a group, are the three years significantly different from one another? The manova1 function can answer that question. The first output, d, is an estimate of the dimension of the group means. If the means were all the same, the dimension would be 0, indicating that the means are at the same point. If the means differed but fell along a line, the dimension would be 1. In the example the dimension is 2, indicating that the group means fall in a plane but not along a line. This is the largest possible dimension for the means of three groups. The second output, p, is a vector of p-values for a sequence of tests. The first p value tests whether the dimension is 0, the next whether the dimension is 1, and so on. In this case both p-values are small. That's why the estimated dimension is 2. The third output, stats, is a structure containing several fields, described in the following section. The next three fields are used to do a canonical analysis. Recall that in principal components analysis (Principal Component Analysis (PCA)) you look for the combination of the original variables that has the largest possible variation. In multivariate analysis of variance, you instead look for the linear combination of the original variables that has the largest separation between groups. It is the single variable that would give the most significant result in a univariate one-way analysis of variance. Having found that combination, you next look for the combination with the second highest separation, and so on. The eigenvec field is a matrix that defines the coefficients of the linear combinations of the original variables. The eigenval field is a vector measuring the ratio of the between-group variance to the within-group variance for the corresponding linear combination. The canon field is a matrix of the canonical variable values. Each column is a linear combination of the mean-centered original variables, using coefficients from the eigenvec matrix. 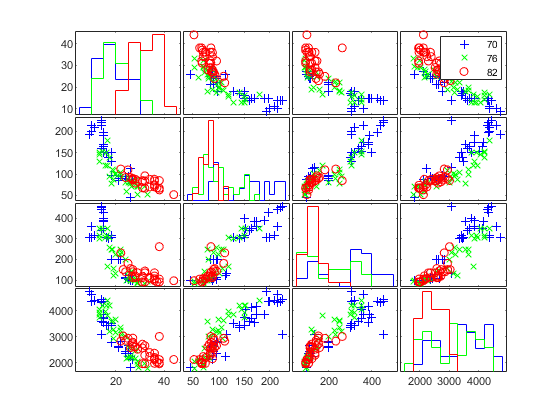 Plot the grouped scatter plot of the first two canonical variables. 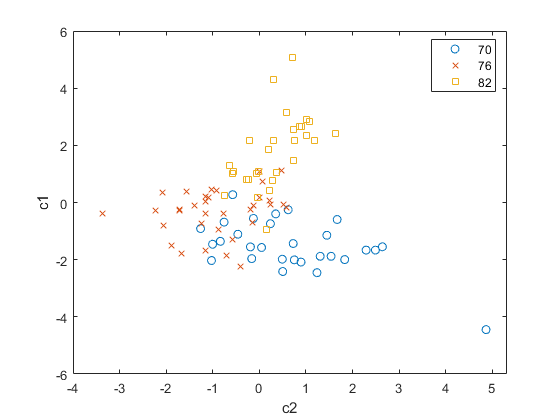 A grouped scatter plot of the first two canonical variables shows more separation between groups then a grouped scatter plot of any pair of original variables. In this example, it shows three clouds of points, overlapping but with distinct centers. One point in the bottom right sits apart from the others. You can mark this point on the plot using the gname function. Roughly speaking, the first canonical variable, c1, separates the 1982 cars (which have high values of c1) from the older cars. The second canonical variable, c2, reveals some separation between the 1970 and 1976 cars. Find the largest distance from the group mean. Find the point that has the largest distance from the group mean. Find the car model that corresponds to the largest distance from the group mean. The gmdist field measures the distances between each pair of group means. Examine the group means using grpstats. Find the distances between the each pair of group means. As might be expected, the multivariate distance between the extreme years 1970 and 1982 (11.1) is larger than the difference between more closely spaced years (3.8 and 6.1). This is consistent with the scatter plots, where the points seem to follow a progression as the year changes from 1970 through 1976 to 1982. If you had more groups, you might find it instructive to use the manovacluster function to draw a diagram that presents clusters of the groups, formed using the distances between their means.